Observation - Bumblebees - UK and Ireland. 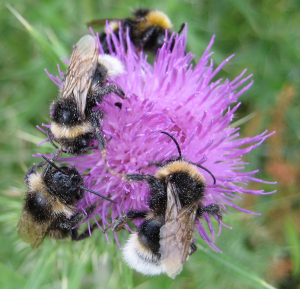 Description: What struck me was the four bumblebees all feeding on a single thistle head. There were 10 on the plant in total. Why so many on just the one head? What struck me was the four bumblebees all feeding on a single thistle head. There were 10 on the plant in total. Why so many on just the one head?